The dollar tumbled after officials indicated interest rates will rise slower than they previously estimated. The central bank said higher interest rates in April are unlikely. (Bloomberg) — U.S. stocks rallied with Treasuries, while the dollar tumbled after the Federal Reserve said data suggest economic growth has moderated and officials indicated interest rates will rise slower than they previously estimated. The Standard & Poor’s 500 Index surged 1.2 percent at 4 p.m. in New York, erasing an earlier drop of 0.6 percent. The Russell 2000 Index of small companies rose to a record, while the Nasdaq Composite Index briefly climbed above 5,000. The yield on 10-year Treasury notes sank 14 basis points to 1.92 percent. 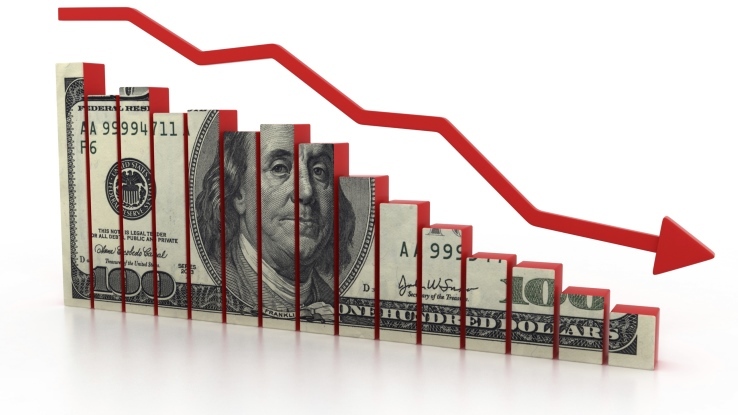 The Bloomberg Dollar Spot Index dropped 1.6 percent. Oil advanced 2.4 percent to halt a six-day losing streak. Gold surged 1.8 percent, the most since January. Stocks surged as investors saw the statement as doing little to speed up the schedule for higher interest rates. Officials said they’d wait for confidence that economic growth is pushing up prices while at the same time noting that growth has moderated. Fed officials also lowered their median estimate for the federal funds rate at the end of 2015 to 0.625 percent, compared with 1.125 percent in December forecasts. The central bank said higher interest rates in April are unlikely and it won’t tighten until it is “reasonably confident” inflation will return to its target and the labor market improves further. Fed-funds futures trading in the U.S. showed a 42 percent chance the central bank will raise its benchmark rate to at least 0.5 percent by September, according to data compiled by Bloomberg. Prior to Wednesday’s policy statement, the odds were 54 percent. While the Fed dropped an assurance it will be “patient” in raising interest rates, Chair Janet Yellen said it doesn’t mean the central bank will be impatient. She also said the Fed is likely to remain “highly accommodative” even after its first rate hike. Yellen is preparing for an exit from the most aggressive easing in the Fed’s 100-year history. The central bank is trying to reconcile a strong labor market with falling inflation as it moves closer to lifting borrowing costs this year. The S&P 500 has more than tripled since its bear-market low in March 2009, propelled higher by unprecedented central-bank monetary stimulus and a rise in corporate profits. Officials added the phrase “patient” in their December statement, removing a reference to “considerable time” in describing how the central bank plans to normalize its monetary stance. Yellen has said the promise to be “patient” means the FOMC would probably wait at least two meetings before raising rates. The Fed must contend with the effects of a higher dollar. The Bloomberg Dollar Spot Index, which measures the U.S. currency against 10 leading peers, had been trading near the highest level in data going back to 2004. A stronger currency can limit the pace of expansion by making U.S. exports more expensive, and it threatens to further restrain inflation, which has lagged behind the Fed’s goal for 33 straight months. The dollar index gained 20 percent in the past year through Tuesday and is up more than 4 percent since the Fed last met on Jan. 28, amid faster growth in the U.S. relative to other economies and expectations for rate increases this year. The S&P 500 now sits 0.9 percent below its March 2 record after falling as much as 3.6 percent from that level on concern that the stronger dollar will hurt corporate profits. The Nasdaq Composite has jumped 2.7 percent since March 11 to close 1.3 percent below its record from the dot-com era. All 10 of the main S&P 500 groups advanced at least 0.5 percent on Wednesday, paced by a gain of 2.7 percent in utility shares. The group has the second-highest dividend yield in the index. Among stocks moving Wednesday, Transocean Ltd. rallied 8.8 percent and Denbury Resources Inc. surged 7.6 percent to lead a 2.9 percent rally in energy shares. Oracle Corp. rose 3 percent after boosting its dividend by 25 percent. The software maker reported fiscal third-quarter sales that missed analysts’ estimates, hurt by a rise in the U.S. dollar and weak corporate demand for cloud software. FedEx Corp. dropped 1.4 percent after it became the latest multinational company to say the currency will cut into full- year profit. The operator of the world’s largest cargo airline narrowed its full-year profit forecast. Gold for immediate delivery climbed 1.3 percent to $1,164.39 an ounce in New York, heading for the biggest gain since Jan. 30. Through March 17, gold prices fell almost 3 percent in 2015 on concern that rates would rise, cutting the appeal of the metal, which generally offers returns through price gains. The benchmark rate has been near zero since 2008. West Texas Intermediate for April delivery gained 2.8 percent to $44.66 a barrel in the New York. Earlier, it slid as far as $42.03, the lowest level since March 2009. Brent for May settlement gained more than 4 percent to end at $55.91 a barrel in London. – With assistance from Paul Dobson, Sofia Horta e Costa and Cecile Vannucci in London, Nick Gentle in Hong Kong and Callie Bost and Joseph Ciolli in New York. Can investors rely on return on investment as a means of generating income?